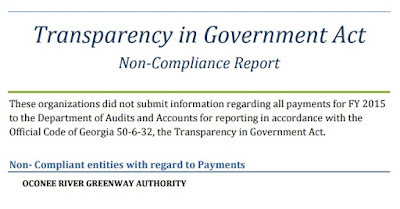 I'm messing around the Georgia open government site and decided to click on the section that includes state entities that failed to turn in the paperwork. Here's the fiscal 2015 entry below. Just one group. The greenway authority I don't know anything about, other than what I can skim from its website. It's also listed as not having fulfilled its paperwork obligations on fiscal 2014 and 2013. Tsk tsk tsk. The 2016 UGA salary data is available, so let's do our annual peek at all the folks who make far more a year than I do. OK, look hard at that list and wonder, where's Kirby Smart, the head foohbah coach? He's way down the list with a measly $227.536.21 annual salary. Huh? 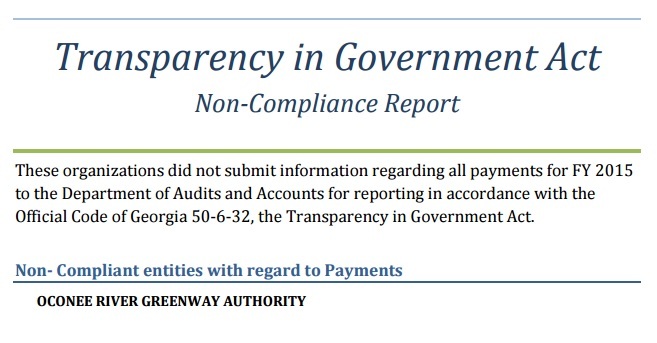 Because most of his salary comes not through state dollars than athletic department funds, so that's the only part listed in official Georgia data. He makes in the millions. Doing averages for titles like assistant professor is possible, but problematic. If you're curious, the average salary for an assistant professor is $87,980.55. Keep in mind that sometimes people leave, or start halfway through the fiscal year, and the numbers can be a bit weird. There are several assistant professors listed below $10,000. The average for associate professors is $100,736.04. For full professors (that's me), it's $127,069.64. To be clear, I don't make the average (insert bitterness here). I'm a full professor. There are many assistant professors who make far more than me (one listed at $275.726.80 ... and, sigh, yes, most of these are at the biz school). In fact, I count 19 assistant professors who make in excess of $200K. WTF. The salary data includes travel monies. Lots of these come from grants or are part of the job, so don't freak out. That said, here are the Top Five travelers, at least in terms of money listed. I could go on and on, but why bother. There is a pretty good correlation between salary and travel (r = .52, for you statistical nerds out there). In total, $18,430,000.18 was spent on travel. That's $18.4 million. That's a lot of Delta skymiles. By AAU, I don't mean sports, I mean the Association of American Universities, the 62 (so far) top research universities in North America. UGA would love to be invited. That sticky stuff? That's UGA administrative drool -- at the notion of being asked to sit at the big kids university table. So far, it ain't happened. I've written about this before, most recently here in which I looked at world university research rankings to show UGA is better than at least a few of the members, measured by these rankings. For example, in those data, UGA is 204th worldwide, far better than AAU member University of Oregon, which is 342nd. The AAU tends to invite a school every five or 10 years, give or take. It last invited a school in 2012 (Boston University, the first private school invited since 1995). Before that, it was Georgia Tech, our friends just down the road. Of the last 10 schools invited, eight were public universities, I suppose because all the really good privates were already in. You can see the full list here. It started back in 1900 with 12 schools, nine of them privates with the usual suspects (Harvard, et al.). By 1922 they'd invited 10 more. In total, 36 schools are public, 26 private. There are specific criteria to be invited, plus it requires a vote of the members. As Emory and Georgia Tech are already sitting at the table, it's hard to say if UGA would or would not get their votes. Looking at the years schools joined, it's really hard to see a trend. Counting backwards, here are the gaps between new members: 2, 9, 5, 1, 6, 4, 3, 8, 5. So there's that big 9-year gap, but also a 1-year gap. This excludes the 2012 entry of Boston University, so before that first "2" you could add a 4 or 5, depending on when you count 2016 or 2017. My prediction? UGA may get an invite in the next five years, but I would not be surprised if it never comes about. In the SEC, Florida, Missouri, Texas A&M, and Vanderbilt are members. Some of those have the advantages of med schools, engineering schools, or both -- key to producing the kinds of grant money so respected by the AAU. Georgia certainly ranks with those SEC brethren, and indeed that pretty much exhausts the list of quality academic SEC schools, but I just can't tell if AAU is ready to commit to the G.
If you're UGA, maybe you should avoid those noon kickoffs. Here's a table of the regular season organized by time of day, with of course noon games coming first, followed by 2:30, 3:30, 5:30 and 7:30 p.m. Clearly we didn't do all that well on noon games, squeaking by powerhouse Nicholls State and getting clubbed to death by Ole Miss, losing to Vandy (Vandy? ), and (sigh) Georgia Tech. So at noon, we boasted a 2-4 record. Ouch. Hey, but at least we were undefeated at 2:30 p.m. with a 1-0 record (just one game, that makeup with South Carolina on a Sunday). For the record, we were also undefeated on Sundays this season. At 3:30, UGA was 1-2, improved and was undefeated at 5:30. And those 7:30 games? Won both of 'em. Barely, yeah, but victories nonetheless. The lesson? UGA needs to play late games, not early ones. And avoid 3:30.